I was looking for a used Maxima and had a very specific color and features in mind. I made the drive to Gerald Nissan in Naperville because I knew they had a pretty decent sized inventory on their lot. I met Howard, my salesperson, as soon as I was walking in. He was very friendly and approachable. As soon as I told him what I was looking for he dashed off and quickly pulled up the perfect car. I absolutely love my new car, and Howard did an awesome job helping me. Thank you! David listened to what we needed and provided us great options. We walked out with a car that had everything we wanted in under 2 hours. Service is exceptional from the moment you arrive to the time you leave. Jason O'Connor was an extremely helpful and knowledgeable sales person. I realize that I was a tough customer to deal with, yet he never seemed frustrated and kept a calm and cool demeanor. I will be honest, I did have a slightly cheaper payment option available at one of your competitors, but I got the vehicle from Gerald ONLY because of Jason. Thank you! Service writers Robert and Anthony always go above and beyond expectations. They make my service a top priority!! As always Mark J. Is always very helpful..His quotes are right on..
John was not a high pressure salesman, like I dislike. The buying process was very painless. William the finance person was very knowledgeable and helpful. We will be recommending Gerald Nissan to friends and family! Everyone here was courteous and knowledgeable. I didn’t feel pressured to make a purchase and they allowed me the time and space I needed to make my decision. I would definitely recommend not only Gerald Nissan but Howard as well, he was a pleasure to work with as was everyone else involved in my purchase. They made me the deal I wanted and for the first time in purchasing a car where I felt that it was a great purchase . Car was ready on time for me to pick up, there was a review of car features and follow up calls to see how I liked the vehicle, very attentive and I love my new car ! I was looking for a used car since I lost mine in an accident. I met Howard and he was just awesome to deal with. As we talked I found out that both he and I had more in common than most since we both served our community. 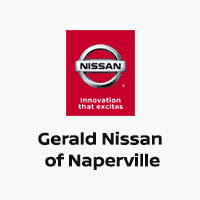 At Gerald Nissan of Naperville, we are proud to serve the people of Naperville, the surrounding suburbs, and Chicago. Our goal is to offer everything you need to make the purchase and ownership of your next new car as hassle-free as possible. You’ll find a variety of cars, SUVs, and trucks for sale at our dealership, along with a top-notch service center and an amazing staff who is willing to help with anything you might need. You can expect a great experience each time you visit our dealership. As part of the Gerald family of dealerships, the team at Gerald Nissan of Naperville believes in providing our customers with a lifetime commitment to excellent service. Our goal is to build a relationship with each customer who walks through our doors. We want to help you find just what you need without any pressure or stress. When you shop with us, you can shop with confidence knowing that you are working with a team who is committed to you, not just to sell you a car, but also to meet your ongoing automotive needs for life. You can always count on us for honest information, fair prices and real assistance that puts your needs first. When you shop at our dealership, you can expect only excellent service. We would like to invite you to browse our huge selection of vehicles, including both new and used cars, trucks, vans, and SUVs. We have all kinds of vehicles available so every driver can find their perfect match. We have all of the most popular new Nissan models ready for you to test drive. Whether you’re interested in a Nissan 370Z, Titan, Murano, Altima, Pathfinder, Armada, Sentra or Rogue, we can help you find just what you need at our dealership. If you’re looking for something a little more affordable, be sure to take a look at our used cars as well. These vehicles are all offered at competitive prices to help you save and they have all been carefully inspected to ensure they’re in great condition so you can feel confident behind the wheel. Whether you’re looking for a new or used car, our friendly staff is ready to help you find the car of your dreams. Feel free to browse our extensive inventory of new and pre-owned cars online from the comfort of your own home. Then when you’re ready to get to know some of these cars a little better, schedule a test drive so you can see how your favorite car handles and get to know some of its features. That way, you can get all the information you need to decide which car is the perfect fit for you. We have all of the most popular Nissan models in our showroom ready for you to drive. Our friendly team at Gerald Nissan of Naperville is ready to help you determine which car will best meet your specific needs. We would be happy to answer your questions, make suggestions and arrange test drives to help you choose the right vehicle. Yet we realize our inventory is always changing, so there’s a chance we won’t have the specific car you want. If this is the case, check out our CarFinder. All you have to do is fill out a simple form that tells us what specifications you’re looking for in your next vehicle. Then when a vehicle that meets your needs arrives on our lot, we can contact you and hold the vehicle until you arrive. Finding your perfect vehicle has never been so easy. At Gerald Nissan of Naperville, we are committed to not just helping you select a car, but also to helping you make the most of your investment. That’s why we have an in-house financing center to help make your purchase convenient. We have a team of experts who will discuss your options and preferences with you to find the solution that best suits your needs. We can help you get an auto loan or lease that works for you and work out a payment plan that suits your budget. You can apply for financing while at the dealership, or save some time by starting your finance application at home through our online financing center. Soon after, we will get started on finding the finance solution that works best for you. As part of our lifetime commitment to our customers, we offer more than just our vehicles and financing. We also offer a comprehensive Parts, Service and Collision Center where we can take care of all your maintenance, repair and parts needs. At our state-of-the-art service facility, our highly-skilled technicians can take care of any routine auto service your car might need to keep running smoothly, as well as any repairs it may need along the way. We can also help you find and install any new auto parts your car might need. If you’re in a collision, you can turn to our body shop in Naperville, IL to repair your car and get it back on the road as good as new. If your car needs any service or you are looking for a part, our Parts, Service and Collision Center is ready to help. And before you bring your car on over, remember to view our service specials page to see our current specials so you can save on your service. At Gerald Nissan of Naperville, we are always ready to help you find a great new or used car and then help you keep that car in great shape whether you hail from Chicago, Joliet or beyond. Be sure to visit our directions page for detailed driving directions to our dealership, so you can plan the quick trip to our dealership. Then when you’re ready to take care of all your Nissan needs, don’t hesitate to pay us a visit. Together, we can help you find and maintain your perfect vehicle so you can enjoy an amazing driving experience each time you get behind the wheel.